Very slim GSD puppy does not enjoy his food. he is still not gaining weight, all the gsd videos that i see on youtube etc show a much healthier GSD pup...he must be around 18 lbs or so right now. What should i do??? should i change his food?? If yes then what should i give him??? I am in Pakistan and here we do not have access to great vets or many varieties of Dog Foods. Total German Shepherd: To start, I would stop feeding your German Shepherd puppy all those different foods at each individual meal. That is so confusing to the puppy. And cut out the milk too. Some variation in diet occasionally is fine (such as adding a treat) but by changing the type of food at each meal you are actually encouraging your puppy to be finicky. And this can be very hard to unlearn once it is instilled. 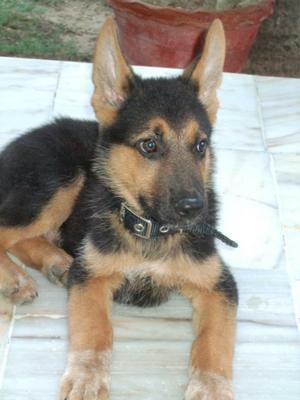 For best results choose one main food source that you can offer your German Shepherd puppy at each meal and stick with it - such as the Pedigree puppy food you mentioned above. The GSD puppy may balk at first at this - especially since it is used to so much variation in its diet - but over time should be fine eating virtually the same foods at each meal with no problems. Later when it becomes an adult you can change the food to an adult dog food and then continue on the same. And is here even more info on feeding German Shepherds and managing German Shepherd Puppy growth. And remember, it's better for your German Shepherd Puppy to be on the slim side (not boney) than heavy any day.